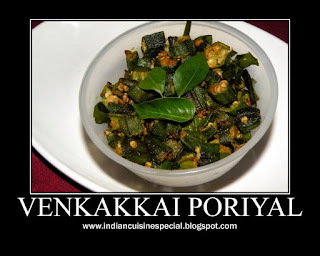 Wash okra (Vandakkai)and dry it with paper towels. Trim the rough tops and skinny bottom tips off the okra pods, and cut the okra into small pieces. Heat oil in a pan. Add mustard seeds and when they start sizzle and urad dal/black lentils. Fry until lentils get brown in color. Add curry leaves, onion, and green chilli and stir fry until onion starts to change color. Bring okra into the pan, add turmeric powder, red chilli powder and salt to taste. Mix and let it cook for 20 minutes, on low-medium flame, until okra gets roasted. Garnish with fresh coriander/cilantro leaves and serve as a side dish.